Batik is originally an Indian fabric, and also one of the most unique types of quilting fabrics you will ever come across. It’s a fabric with very unique and attractive patterns that are made using wax. In fact, the word “batik” itself refers to wax. What is Batik Quilting Fabric? Batik quilting fabric is basically a type of quilting fabric that comes with attractive patterns, made using a process that involves the use of wax and dying of the fabric. Although the batik fabric is known for the amazing variety of patterns it has to offer, it’s also one of the more versatile options for many different sewing projects, and isn’t limited only to cotton like some of the other similar fabrics. 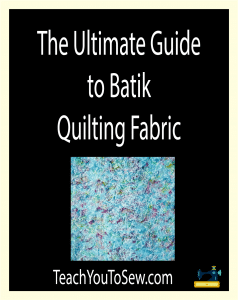 How is Batik Quilting Fabric Made? Now, for those that are wondering how is batik quilting fabric made, we will be walking you through the entire process, which actually only consists of two to three steps. Parts of the fabric are first covered with a coat of wax, which is then followed by dying the fabric. This leads to the areas of the fabric with the wax retaining their original color, paving the way for a great contrasting pattern when the wax is removed. Although this process might sound a bit complicated, it’s actually pretty simple. The simplicity is what the batik quilting fabric is known for, although its simplicity is often coupled with the kind of beauty that’s hard to beat for other types of fabrics. To add to it, even if someone plans to make great black batik quilting fabric or even green batik quilting fabric, they need not have any artistic skills to be able to do so. Interestingly, many of the best patterns on batik fabric are often created by chance, which also makes it a fun fabric to make or even work on. Finally, as the batik fabric is very versatile with many pattern options, you can go for any colors including yellow, red, brown, pink, orange and more. Where are Batik Fabrics Made? Currently, a major part of the production of quilting batik fabric is based in Indonesia’s Java island. This is because the materials required for a large scale production of the batik fabric are readily available there, which mainly include beeswax, the plants that are used to extract the different types of vegetable dyes required in the process, and cotton, which is the most popular type of batik fabric. Needless to say, the availability of these resources has also led to a large number of workers getting trained in making the batik fabric with a huge variety of patterns, which too is a major factor in making Indonesia’s Java island one of the biggest manufacturers of the batik fabric. What Kind of Fabric is Used for Batik? As we just noted above, batik fabrics are often 100% cotton, which is the most common type of batik fabric you will find. While cotton is probably the easiest fabric for making batik, it’s actually also the best quilting fabric for batik dyeing, meaning that you’re likely to get much better results with cotton when it comes to making batik than other fabrics. However, 100% rayon batik fabrics are also fairly common for making batik. Similarly, there are also many other types of fabrics that are used to make batik, but they primarily include natural fabrics. However, silk usually turns out to be the most challenging type of fabric to make batik patterns on, due to its wicking properties that are very different from other natural fabrics. As we discussed above, batik is actually believed to have originated in India. However, we are talking about a time as back as about 2000 years ago. It’s also believed that it used to be found in some other regions as well at that time, such as Far East and Middle Asia. However, regardless of where batik first initially originated from, it ended up reaching at the peak of its potential as a type of fabric in Indonesia – its Java island region in particular. It’s believed that batik made its way to the country in 1677, but it quickly became a part of its ancient culture. It then became the biggest producer of the batik fabric in the world, with some of the finest batik cloth being made there. Batik fabrics have a lot to offer no matter the kind of sewing project you may be working on. However, you would be able to get the most out of them only if you know how to go about using them the right way. So here are a few tips that will help you make beautiful pieces of cloth using the batik fabric. It’s highly recommended to pre-wash batik fabric in order to avoid the possibility of their dye getting messed up in any way when working on it. Many types of batik fabrics can only be hand-washed, so make sure you go through all the details carefully before putting them in the washing machine. Air drying is the most recommended way of drying the batik fabrics, ideally at a place where they are subjected to direct sunlight. If you prefer using a tumble dryer, make sure you use it on a very low setting. Avoid twisting the fabric to get rid of the water at all costs. Due to the effect the wax creates, batik fabrics often have both their sides looking very similar to each other, making it difficult to identify which is the right side. In such a case, you can check the edges. The side that’s less blurry on the edge would work better if used as the right side when working on it using a sewing machine. Batik fabrics usually come with a tighter weave or a denser thread count, as it helps them withstand the dyeing process better. However, this also means that they may feel stiffer than other fabrics. While this may have some downsides, the good news is that they tend to fray considerably less and turn out to be a great choice for applique. Finally, you must use a sharp needle when using any type of batik fabric for a sewing project. We recommend purchasing your batik fabric at Amazon.com or Fabric.com. They have the widest selection of affordable, quality batik fabric.